There’s great power we can derive from pain in our lives. Pain is initially always a gentle reminder that all’s not well. That it’s time for us to take immediate, cognitive action. It is like driving on a highway and your car’s dashboard indicates that you are low on gas. If you ignore that alert and keep driving past gas stations in the hope that you will ‘pull it off’, you have chosen to risk it and may spend a considerable amount of quality time organizing to fetch fuel by either flagging down vehicles passing by or trudging up to the nearest gas station on foot! The moral is simple: Only when it is continuously overlooked or neglected, does any pain become unbearable or lead to suffering. However, when we heed the early warnings that pain gives us, we can draw great transformational benefits from it without having to experience any suffering. The first step is to feel the pain, which is to be awake and aware. Next is to go to its cause, the root. Third is take steps to eradicate the cause of pain or alter the causative factors. So, in effect, all pain is a call for action. Yet we miss this opportunity to leverage pain because we view pain as a source of debilitation and not as a liberating, empowering force. This applies to pain from a physical dimension (an injury or a troublesome body-ache), from an emotional angle (a heartbreak in a relationship) or on a spiritual plane (as sorrow and the resultant seeking of happiness). The Buddha taught that pain can be a catalyst for transformation, an empowering agent. It may also be pertinent to reflect on the wisdom of the legendary lyricist Majrooh Sultanpuri who invited us to consider sorrow (the commonest avatar of pain) as an ally in this song from Dosti (1964, Satyen Bose, Lakshmikant Pyarelal, Mohd. Rafi). Watch the video here. 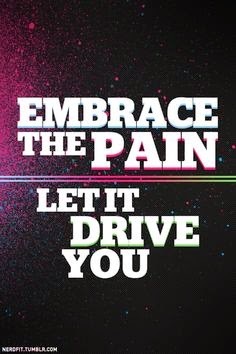 Embrace your pain. Draw power from it!